Cathy Gale vs. The Gong Man. Michael Goss. Five pages. Stuntmen / Judo Teachers The Robinson Brothers and their influence on third season Cathy Gale. Brought To Book: The Drowned Queen. Graham P. Williams. Two pages. Review of the US-only paperback. 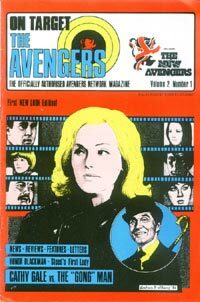 File On An Avengerphile. Part One - The Stuff of Legends. Geoff Barlow. Three pages. The Author of 'The Saga Of Happy Valley' on what attracted him to The Avengers. Curry A La Carte. Stephen and Joy Curry. Regular information on the current activities of various Avengers luminaries.